Maytag’s place at the top of the forced air food chain is thanks to their dedication to reliable high-efficiency equipment. Their latest gas/electric packaged unit, the PPG2GI, lives up to Maytag’s reputation and then some. This heating & cooling solution is equipped with cutting-edge technology and built to withstand years of heavy use, making it the perfect in almost any application. 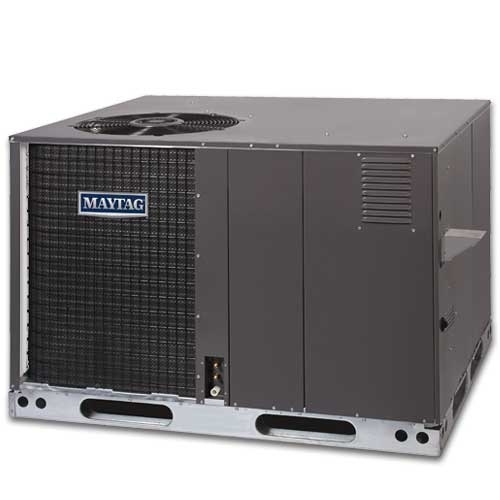 Maytag’s PPG2GI is the first invert-driven packaged unit in the industry. That alone would be enough to grab some headlines and make some sales, but Maytag did a lot more than just adding an inverter to keep your customers’ energy costs low. It’s worth noting that the PPG2GI doesn’t just have any old inverter, it’s equipped with Maytag’s iQ Drive. The iQ drive compressor can modulate between five different capacities ranging from 40% to 118% of the rated capacity and it gives PPG2GI units a 20 SEER rating. In addition to providing consistent, efficient comfort, the iQ drive is also substantially quieter than a traditional compressor. As a result of this incredible efficiency, the PPG2GI qualifies for both Energy Star and ecologic listings. For the coils, Maytag opted for a mix of materials. The condenser coils utilize an all-aluminum design while the evaporator coils employ Anteater copper tubing with aluminum fins. This layout gives the PPG2GI world-class heat transfer capabilities without sacrificing reliability or durability. Finally, a variable speed ECM blower motor is installed to lower electricity usage even further, ensure quiet operation, and keep your customers comfortable. The blower automatically responds to changes in the static pressure and features 16 cooling speeds and 8 heating speeds for optimal consistency. There are a number of safeguards and features built into the PPG2GI that make it a dream for contractors to install and maintain. Maytag went to great lengths to eliminate common causes of compressor failure, saving you from making extra emergency service visits. To start, the control system utilizes algorithms to monitor system operation and protect the inverter-driven compressor. A suction accumulator and restart time delay are present to address typical sources of trouble for compressors, resulting in a remarkably reliable unit. The compressor isn’t the only area that got some love from Maytag, the igniter is also well-protected. Starting with an already reliable hot surface igniter, Maytag doubled down and added a Smart Start control board. This board monitors the rate at which the igniter heats up and uses that data to create ideal ignition times, reducing stress on the igniter and making it last longer. Maytag’s PPG2GI also features plenty of improvements dedicated to improving installation time. All of the controls and the compressor are located near a convenient access door. There are also full perimeter base rails to make it easy to get the unit to the installation point. Finally, an auto-reset high-pressure switch saves you from unnecessary visits once you’ve got it installed. We’ve already touched on the number of internal improvements that Maytag made to promote longevity and reliability, but we’d be remiss to skip out on all the features that make the PPG2GI one of the toughest pieces of HVAC equipment we’ve ever seen. The cabinet is built from galvanized steel and it has a polyester urethane finish that outperforms similar units by up to 50% when it comes to corrosion resistance. The wire guard that protects the coil is coated in an epoxy and backed by a plastic mesh hail guard. Additionally, the PPG2GI utilizes a one-piece design for the top of the unit that keeps everything dry during inclement weather. Standard features like a factory-installed suction drier in the liquid line and a condensate pan that resists corrosion are also present. The Maytag PPG2GI gas/electric packaged unit is available for order from Able Distributors in sizes of 2, 3, 4, and 5 tons. You can stop by your local branch or give them a call today! Please note that this is a non-stock item that will be specially ordered for your project. Finally found the reasearch to prove you are using I.Q. ( inverter compressor),invented by Samsung, I think in your refrigerators or was it A/C? which came as a surprise!Wonder why you had a 10 yr/warranty of the frig outside of LG frigs.They have smart inverters. Why aren’t you out there on the internet on your I.Q. vs Samsung & LG? I think your the best !! !